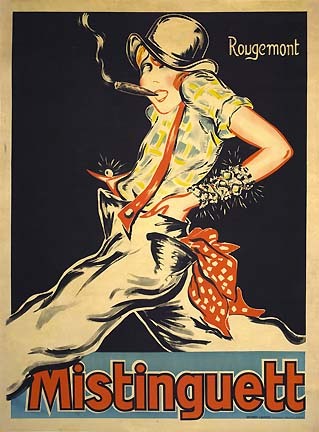 Original color lithographic poster, printed by Richier-Laugier, Paris, France circa 1927. Condition: Very Good (B) Restored losses mostly in margins, great color and full margins, backed on linen. Sheet size: 62.5 H. X 46 W.
In this rare original 1920s poster, Rougemont captures the flamboyant spirit of the famous French actress and singer, Mistinguett seen with her wrists full of jewels, wearing suspenders and smoking a cigar as she charismatically struts her stuff showing off those long legs that she was best known for. At the time this full-size poster was printed, circa 1927, Mistingett was known as the Queen of the Music-Hall with top billing at the Moulin Rouge. She was the most popular French entertainer of the time and the highest paid woman entertainer in the world; quite an accomplishment for a young girl who began her career selling flowers in her home town and then went on to work as a stage-hand at the Casino de Paris.